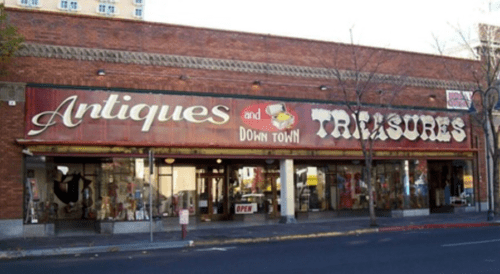 Antiques & Treasures Antique Mall is located in the historic Riverwalk District in downtown Reno. We are located at 151 N. Sierra St, have 50+ dealers and are open daily from 10 am to 6 pm. Art, classic books, estate jewelry, gaming memorabilia, stamps, toys, kitchen collectibles, sports, ephemera, western, coca cola, sterling silver, glassware, ceramics, military, Asian, vintage clothing, hats, purses, and much more.